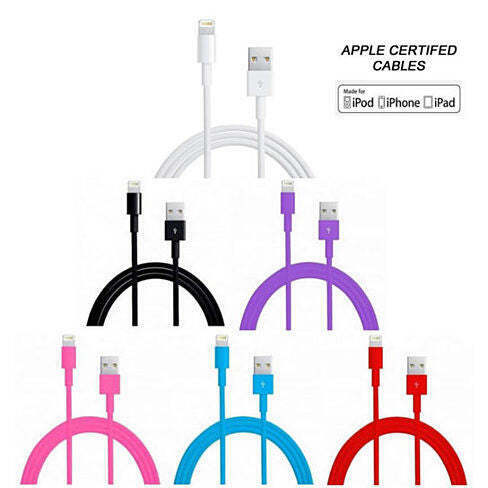 SmarTech brings you Apple Certified MFI authorized cable for iPhone 5, with 8 pin connector. The cable is 6.5ft (2 Meter) in length, allowing you to charge your device super-fast and gives you extra room as well. Comes in multiple colors: White, Black, Pink, Red, Blue, and Lime Green. FEATURES: 2 meter (6.5 feet) Lightning to USB Cable is 100% longer than standard cables. Apple certified compatible with Apple Lightning devices (iPad mini, iPhone 5/5s, iPod touch 5th Gen, iPod Nano 7th Gen, iPad 4th Gen, etc.). Works with any USB charging solutions – wall, car, portable, battery packs, etc. (not included). Made for iPad, iPhone, and iPod. Reversible design Lightning connector makes connecting easier. Includes: 2 meter USB to Lightning Cable.